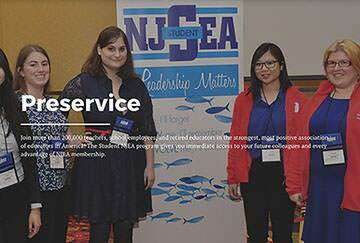 INTERVIEWER: Deanna, you’ve been an ambassador for quite a while now, so, I’m curious as to what has been your favorite experience working with NJSEA at the state level? DEANNA KOLLAR: My favorite experiences have definitely been attending the NEA Student Summer Leadership Conferences with the New Jersey delegation. I was fortunate to attend the Orlando Conference in 2015 and the Washington D.C Conference this past summer. Both times gave me the opportunity to attend workshops with preservice educators from all over the country, which was really awesome. It was interesting to compare the problems that we face in New Jersey with those of other states. Being around so many people that have the same goals and visions for their students and their classroom was an empowering feeling. The whole experience made me excited to return home because I’d be able to try out some of the things I learned for my student teaching. With the emergence of edTPA, preservice educators are faced with a slew of new requirements outside of his or her college’s accredited program, and with these requirements comes uncertainty and discontinuity across college campuses and education programs in New Jersey. Below are experiences from three different preservice educators from three different colleges.